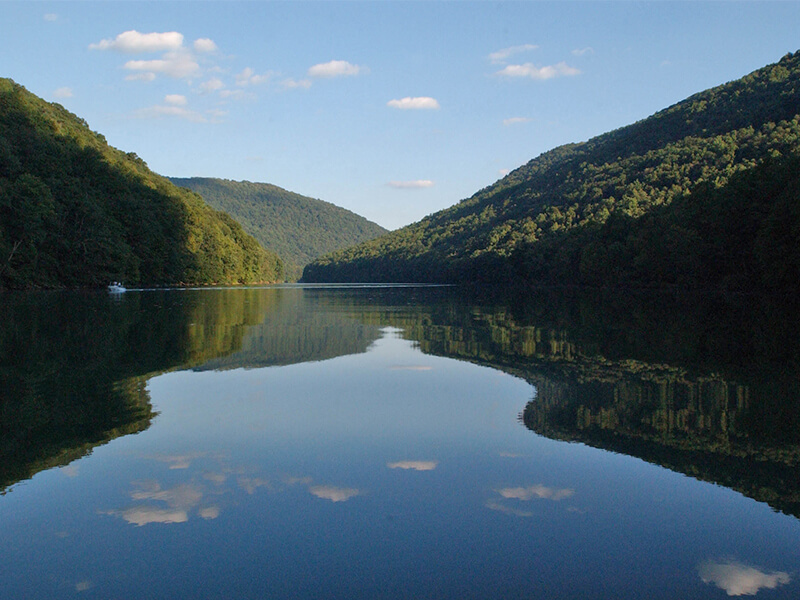 Cheat Lake is a 1,730-acre man-made reservoir located in the northern part of Monongalia County, about 10 miles east of downtown Morgantown and West Virginia University’s Main Campus. Some areas of the lake are a perfect getaway with calm and shady waters where you can drop your anchor, turn on the radio, and crack open a cool drink. These areas are known by the locals as “the backwaters” and are the spots for swimming, canoeing, kayaking, and fishing. Other parts of the lake cater to more adventurous spirits. 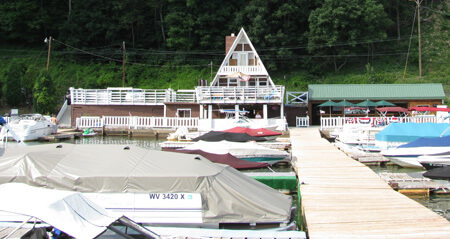 Power-boaters, inner-tubers, jet skiers and water skiers can be found along the main drag of Cheat Lake. Whatever your pace, Cheat Lake is the place. 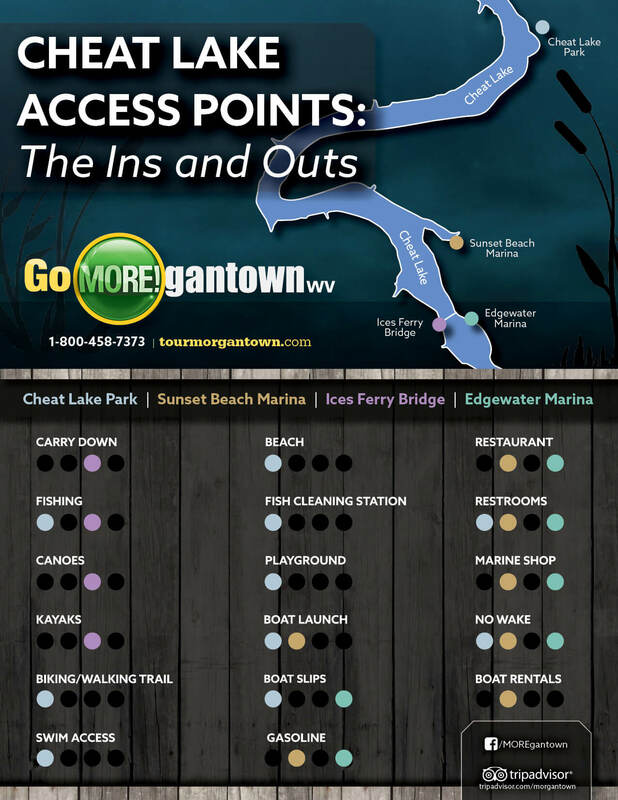 The following are the four public access points to Cheat Lake so you can get in on the fun. Cheat Lake Park, located off Morgans Run Road, is at a no-wake part of the lake, so it’s great for those who want to stay away from fast motorboats. 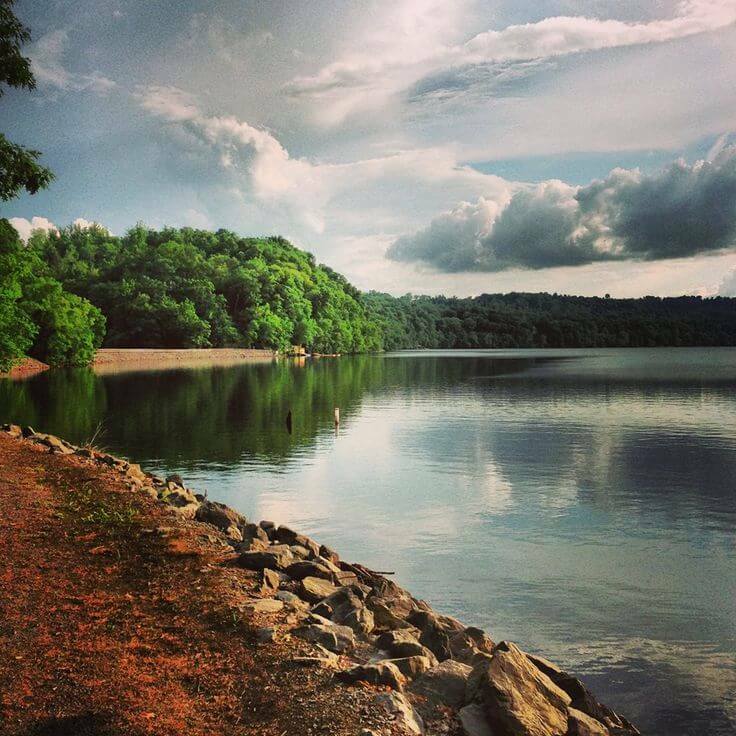 This spot along the Cheat Lake Trail is equipped with family-friendly amenities such as a playground, beach, swimming access, and restrooms. It’s a hit for fishermen, too, with an on-site fish cleaning station. For more information on the type of fishing you can enjoy, click here. Sunset Beach Marina is perhaps the largest of the four entry points. Its gravel parking lot offers 200 spots for those interested in ramp access to Cheat Lake. 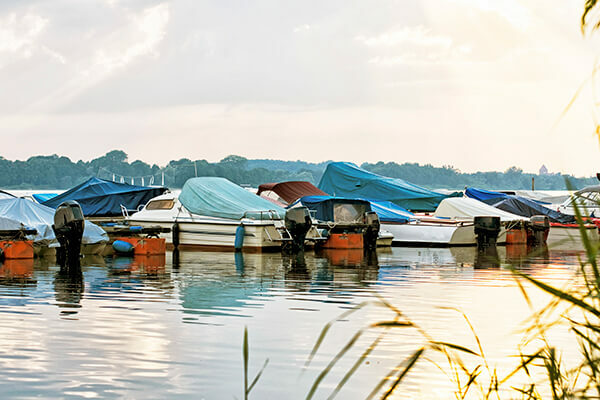 Nearby is Lakehouse on the Cheat, a popular dockside restaurant spot with sunset views, and a stocked marine shop for all of your boating needs. The Ices Ferry Bridge access point is the newest addition to this list. It appeared at the east end of the new Ices Ferry Bridge following its construction in 2013. If you’re a paddle sports enthusiast, this access point is for you. The carry-down access ramp opens up to the upper part of Cheat Lake and is perfect for canoes and kayaks while offering a rocky shore for fisherman to enjoy. Wear a portable flotation device (PFD) while participating in water activities. Have enough PFDs for everyone with you. Summer weekends on Cheat Lake get busy. Choose when and where you go based on the crowd. Be mindful of boat traffic and make sure you know how to fully operate your vehicle. Leave the lake better than how you found it. Take out your own trash if you accumulate any. Know the difference between public and private property. Be mindful that you do not trespass.